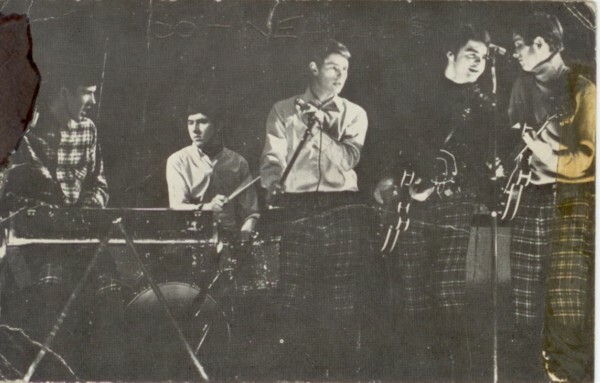 Rockingscots is a website dedicated to Scottish beat groups and rock bands from the '60s and '70s. Go to the Rockingscots homepage for more groups or to e-mail us. 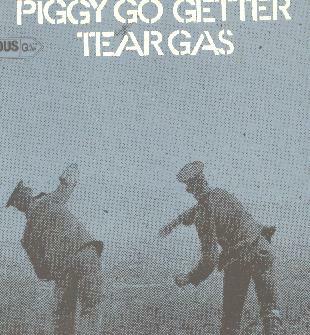 We reckon that Tear Gas were the first group based in Scotland to release an LP - rather than one made by Scotsmen based elsewhere. 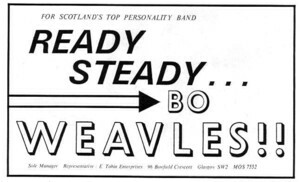 They were also labelled a Scottish 'supergroup' - a title that was in vogue at the time - since their members had all been in other leading bands. 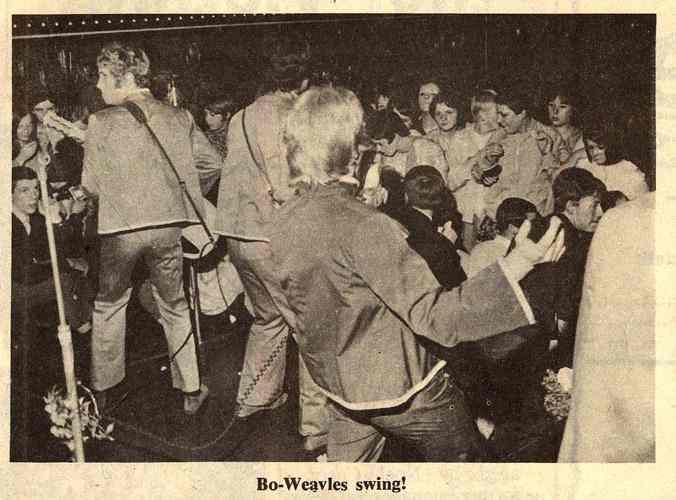 Cleminson and Batchelor had been in a band called the the Bo Weavles as guitarist and organist respectively along with Jimmy Brand (drums) and Ricky Archibald (bass). The Bo Weavles vocalist was the guy below - one George Gilmour. Live pic that has appeared in books before. l-r: Zal Cleminson, Ricky Archibald and George Gilmour. tricked out in psychedelic patterns - and that Albert Clink from Pennilee was the driver/roadie. 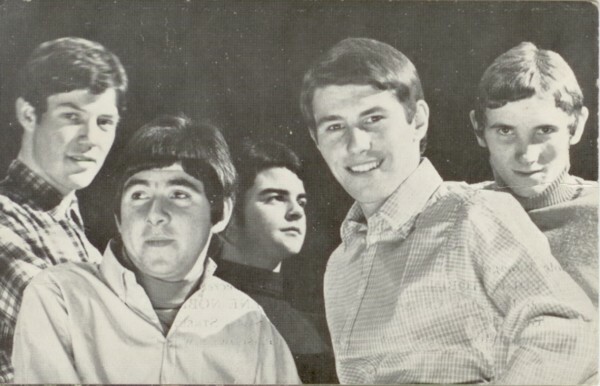 And here are two fantastic photies of the band when slightly younger (c) 1965. Many thanks to Bill Bryceland for these. Note that the top one has Bo-Weavels scratched on it - in case like us you can hardly believe this is the same guys as the top two pics but we are assured that they most definitely are. So, left to right: Davey Batchelor; Jimmy Brand; George Gilmour; Ricky Archibald and Alistair Cleminson respectively. Note that tartan trews were not just the stage gear of choice for Beatstalkers. Anyway, whenever, on the departure of George Gilmour to take up theatre work, the band's name was updated to Mustard and the ex-Poet Andy Mulvey took on the vocals.. More personnel shake ups saw Wullie Munro come in from 'Right Tyme', Chris Glenn from 'Jade', Eddie Campbell from the recently defunct Beatstalkers and Davey Batchelor switched to vocals. To emphasise this fresh start, the name was changed again and so it was that in early 1969 - Tear Gas exploded on the Scottish rock scene. We know, we know. Sorry. By the way - we're told that Zal's nickname arose from his employment in the 'Izal' loo roll factory. Pic below taken by John Young in the dressing room of the Electric Garden in Sauchiehall St, Glasgow. June 1969. Sent to us on 01/11/2018. (c) John Young. Note the tweed jacket hanging on the rail at the back - It makes a further appearance on Davey, three pics down. Looks good on him. Nice decorative features of the room on show as well. before having a multitude of other incaranations. Initial stage set was a mixture of covers with a few originals. Their go at Led Zeppelin's 'Communication Breakdown' stands out in the memory. Recall being impressed with the speed that Zal could replace a broken string during the number - have since of course seen the old 'breaking a string' trick in many a band's stage-act. 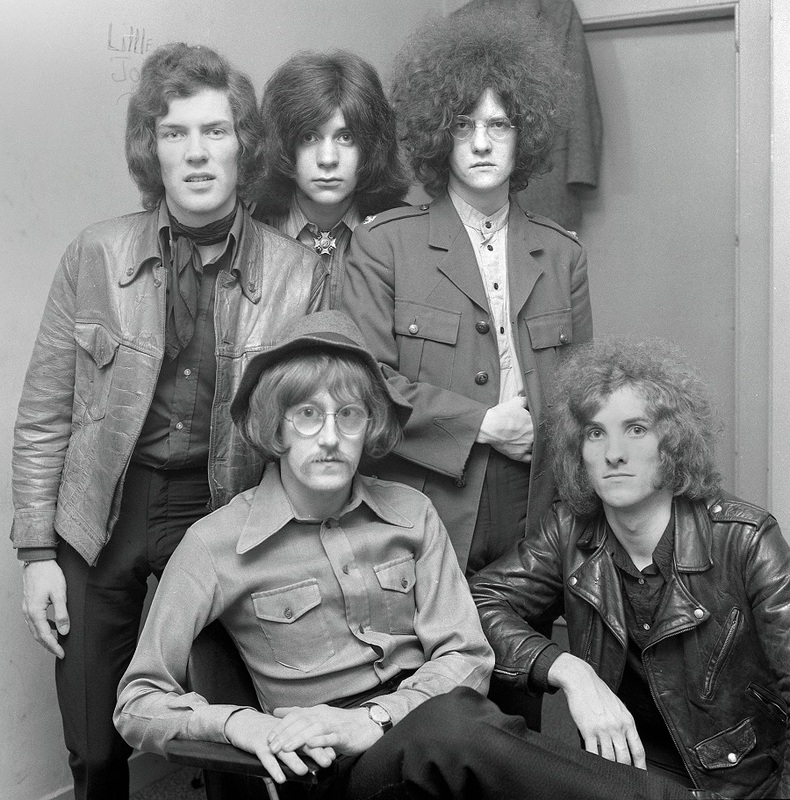 The early band also had a change of stage clothes. First set saw them in crimpolene two piece suits - each a different colour. One of our correspondents felt they looked like cardboard cut-outs. Looked ok to us though. Second set was played wearing more casual clobber. As said Tear Gas actually got to make (and release!) an LP - an unheard of event for a group based in Scotland other than the Alexander Brothers and their like. On the 'Famous G' label. See cover and label etc below. In 1999/2000 we asked, 'Was there was another group that released an LP at same time on 'Famous G' whose name escapes us?' 16 years later came the answer, 'It was by Hate who were a renamed House of Lords according to Alan one of the original roadies. Thanks Alan. 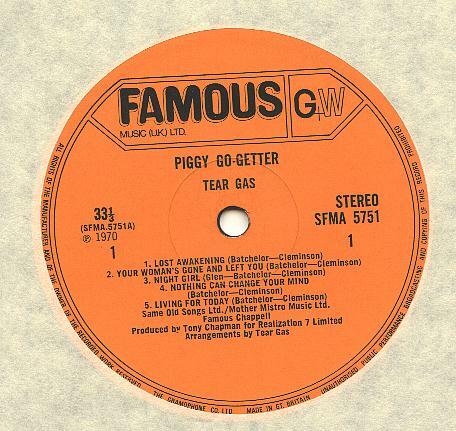 'Piggy Go Getter' SFMA 5751 (yours for 39'10=£1.99 back in 1970) track list. Side One: Lost Awakening (Batch/Clem); Your Woman's Gone and Left You (Batch/Clem); Night Girl (Glen/Batch/Clem); Nothing Can Change Your Mind (Batch/Clem); Living For Today (Batch/Clem); Side Two: Big House (Batch/Clem); Mirrors of Sorrow (Glen/Batch/Clem); Look What Else is Happening (Glen/Batch/Clem); I'm Fallin Far Behind ( Batch/Clem/Munro); Witches Come Today (Batch/Clem). We recall the band themselves telling the audience at the Caledonian in Ayr not to bother buying the album though they did play 'Witches Come Today' in their live act. Perhaps they didn't like the production by Tony Chapman. Songs are not terribly memorable but respectable enough. Acoustic guitars with reverbed harmonies alternate with harder-edged, proggy, time-changing stuff. In truth, the best bit about 'Piggy Go Getter' is probably the cover. Its a fairly luxury job - textured gatefold sleeve with all the words on the back and two long cartoon strips on the inside - Tear Gas' views on the English and the Police. Not sure whether Wullie Munro or Eddie Campbell was the first to leave. Wullie joined Berserk Crocodiles (see Dream Police) and Ted McKenna from the freshly collapsed Dream Police replaced him. Eddie Campbell quit for whatever reason - perhaps just tired of touring - and was not instantly replaced. A second LP, 'Tear Gas' on the Regal Zonaphone label was released by this revised line up though Mr Campbell appears on the 'live in the studio' medley of 'All Shook Up & Jailhouse Rock'. 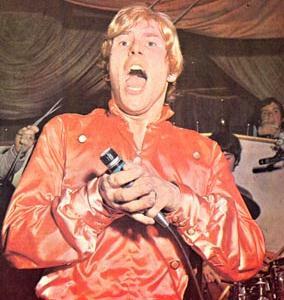 An un-credited Ronnie Leahy provides the keyboards elsewhere on the album. Leahy played with Glen, McKenna and Cleminson again in the early '90s under the name of the 'Sensational Party Boys' - promoters mistook the name for a group of male strippers! ' Saw them in London in the Charing Cross Road Marquee (now a Weatherspoons) - a right good night.. 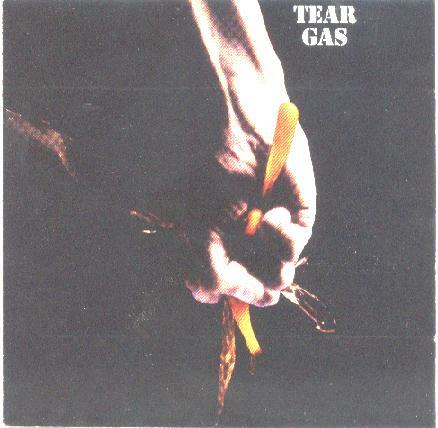 Tear Gas' has an odd front cover pic. Is it meant to signify anything? If so it was lost on us. All tracks are 'hard 'n heavy rock' . Again not terribly memorable apart from 'Love Story', a highlight of the stage act, whose arrangement was visited again by SAHB on the 'Penthouse Tapes'. One is left with the feeling that the band was a couple of years behind the times in their material and the union with Alex Harvey was the shot in the arm of originality they needed. 'Tear Gas' was reissued on CD by Renaissance, a US label, in the mid '90s as RCD1005. 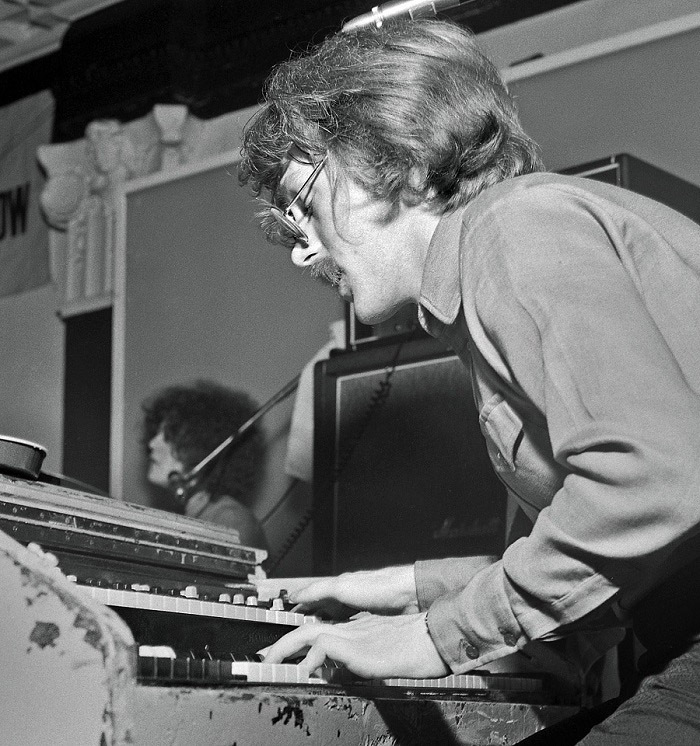 After the failure of the 'Tear Gas' LP, Ted McKenna's cousin, Hugh McKenna, was drafted in on keyboards and backing vocals but Davie Batchelor soon left to go into production - he produced the SAHB stuff - they all sound pretty good - but was famously dropped by Noel Gallagher during the making of Oasis' first album. A rumour went about that he had quit Tear Gas because he was going deaf - must have been nonsense! 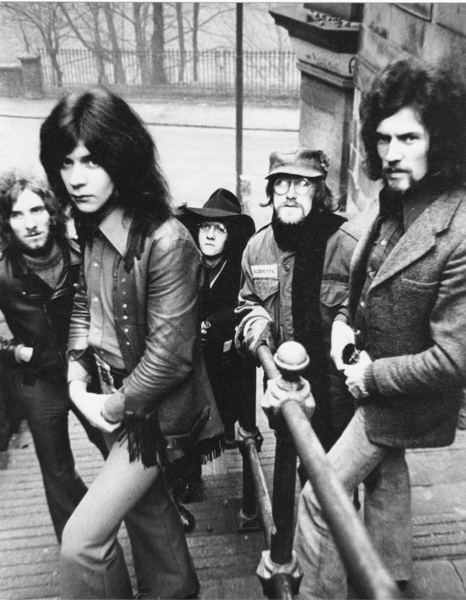 Hugh took over the lead vocals and this is the line-up that returned to Glasgow to join up with Alex Harvey after an unsuccessful stint in London . The rest of that story is well-documented history. Tear Gas seem to have had a fondness for this past-time. We'd certainly never seen anyone else do it before - though of course we may have had a sheltered up bringing. Example one - the Bobby Jones ballroom in Ayr. A fire alarm or phoned in bomb threat had resulted in thousands of dance-goers crowded outside in the main street. Looking up to the first floor dressing rooms the crowd was treated to the sight of several bare arses protruding from the windows. They got banned of course. Pleasure-ama seem to have banned every decent band at one time or another. Example two - The Ayrshire band 'Dusty Hut' are coming back from a gig in Carlisle where they'd supported Tear Gas. Half way up the A74 they are overtaken at dangerously high speed by the Tear Gas van replete with naked bums stuck up against the windows. Our Miff literally nearly died/got killed laughing! Great band. Great gigs. Cheers lads.